When it comes to beautiful coastline, the state of Oregon in the United States certainly has that in abundance. With steep, rocky cliffs, large rock formations (known as stacks), beautiful beaches, and thick coastal forests, the Oregon coast is breathtakingly beautiful. Out of all the roughly 363 miles of coastline in Oregon, my favorite stretch of coast is undoubtedly the section near the town of Canon Beach. Together with Ecola State Park just to the North, the Canon Beach area has some of the largest and most beautiful sea stacks on the Pacific coast of the continental United States. In case it doesn’t look familiar, this is the stretch of coastline that was featured in the iconic 1980’s movie, “the Goonies”. You know, the stretch of coast that hid the treasure of the famed pirate One-eyed Willie. It’s easy to see why they picked this location to film. The Pacific Ocean coastline in Oregon is some of the most rugged and most beautiful coastline in North America. In addition to these jaw dropping rock formations, the area also boasts some of the state’s most beautiful beaches and hiking trails. In this guide, I am going to provide you will all of the information you need to plan your next trip to the Canon Beach and Ecola State Park on the Oregon coast. I outline the best ways to get to the area, what time of year is best to make a visit, where to stay while you are in the area, and other things to see and do while you’re visiting. In addition, I also provide you with a great guide on where to hike and where to go to get the best pictures of this unbelievably beautiful area. The town of Canon and Ecola State Park are located on the Pacific Ocean coast of Northern Oregon. If you are visiting from outside the state or outside the United States, the closest large city with an international airport is Portland, Oregon. 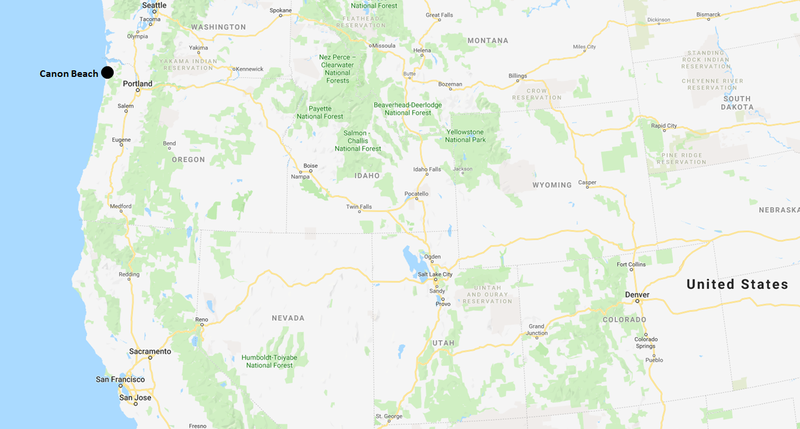 I have included a map below to give you a general sense of the location in the United States. 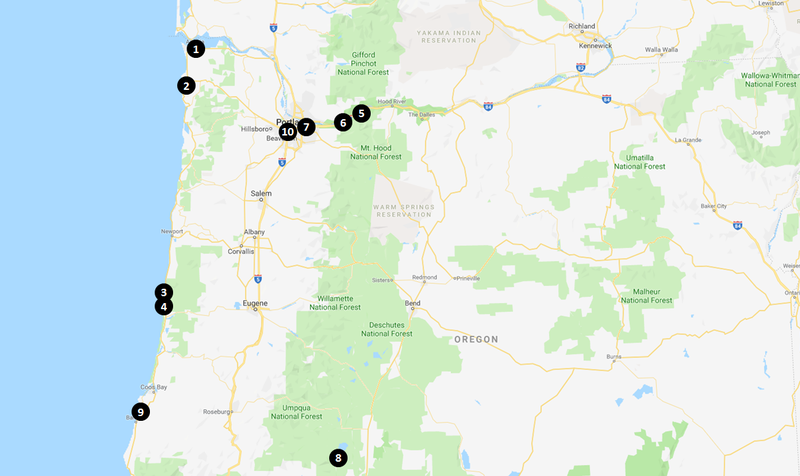 If you are going to be visiting elsewhere in the area or are looking for things to do in addition to seeing Canon Beach and Ecola State Park, I have included a chart below that gives you the distance and driving time to some of the larger cities and other attractions in the area. The Ecola State Park sits just to the North of the town of Canon Beach, so in a way they make up one larger area that visitors can explore. To give you a sense of the layout of the area, I have included a detailed map below for you to review. During the winter months of December thru February, it does get cold on the Oregon Coast, but you typically don’t see the brutally cold temperatures where it falls well below zero degrees Fahrenheit that often. With average highs in the low-to-mid 40’s, the winters are rather mild. Likewise, during the summer months the high temperatures typically don’t get unbearably hot. With the average highs in the upper 70’s and low 80’s during the summer months of June thru August, the summers are rather mild as well. Because we are talking about the Oregon coast, the amount of rainfall the area sees is typically higher than you would see in the American Midwest or Southwest. The rainiest months of the year are the late fall and winter months of November thru January. If you visit during this time, be prepared to see a fair amount of rain or snow. During the summer months of July and August the precipitation levels are the lowest, so you have the best chance of seeing good weather. Ecola State Park and Canon Beach see a fairly steady stream of visitors throughout the year, but it doesn’t get so busy that you will have to deal with overwhelming crowds or venture too far out of your way to get unobstructed photographs. However, if you are looking for the ideal time to visit when the number of other visitors is the lightest, I have included some data on tourist interest for you to review below. NOTE: The chart below is from Google Trends and shows the relative amount of Google searches for the Ecola State Park and Canon Beach by tourists throughout the year. The numbers are calculated relative to the peak month, which is mid July. For instance, August 26th saw roughly 77% of the searches for “Canon Beach” as the day of June 17th, which was the peak day. The cost of accommodations on the Oregon coast during the summer months of June thru August can be quite expensive because it is a very popular tourist area. During the shoulder seasons and winter months, the cost of accommodations is much lower. Even if you are planning to visit during the summer, there are places to stay for different budgets if you look hard enough. To give you a hand in finding the right accommodations for you, I have included a list of recommended hotels at different price points below for you to review. If you would like to save some extra money, there are also a number of quality campgrounds and RV parks in the area that you can stay at. To give you an idea of what is available, I have included a list of recommendations below for you to review. in addition to the abundance of outdoor activities in the area, the city of Canon Beach itself offers a lot for visitors to see and do. The Canon Beach History Center and Museum has some interesting displays that visitors can enjoy and there are an abundance of great shops and fantastic restaurants to enjoy as well. It’s a great place to setup your base camp as you explore the beautiful coast. 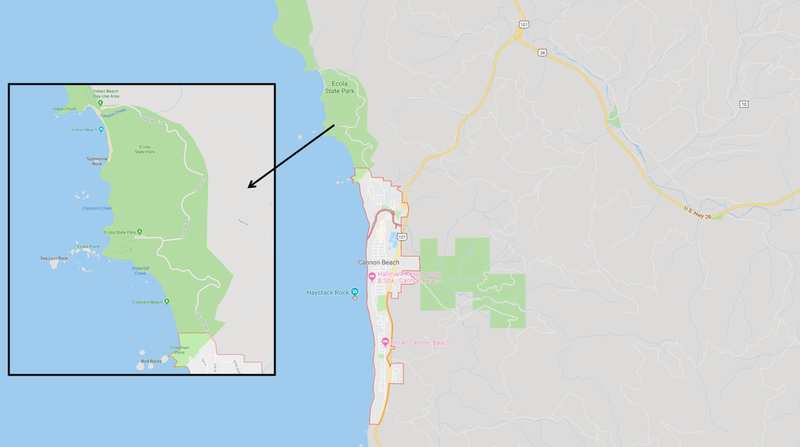 While there are some really nice trails inside Ecola State Park and around Canon Beach, the best trails in the area are to the South in Oswald West State Park. Here, you have a great combination of elevation, beautiful forest land, and a stunning rock coastline. 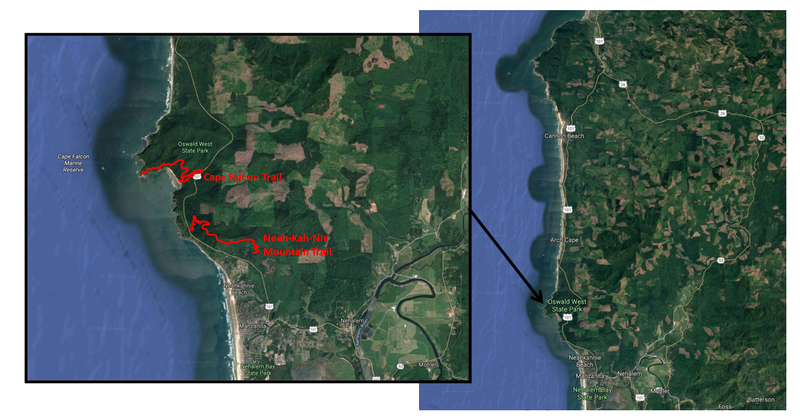 The two best trails in the park are Cape Falcon Trail and Neah-Kah-Nie Mountain Trail. Cape Falcon Trail is a roughly 4-mile out-and-back that is rated as an easy hike. It only has around 600-feet of elevation climb, so climbers of all abilities should be able to complete this hike. The Neah-Kah-Nie Mountain Trail, on the other hand, is a longer and more strenuous hike. This roughly 6-mile hike includes over 2,000 feet of elevation, which makes it much more challenging. For an overview of these hikes, I have included a map below for you to review. The whole Canon Beach and Ecola State Park area is beautiful, so there is a seemingly endless number of places where you can take great photographs. However, there are a few spots inside Ecola State Park that are my absolute favorites. For some ideas on where to go to take pictures, I have included a map for you to review above. PRO TIP: Doing research on a location is one of the best things you can do to increase the quality of your travel photographs. For some tips on how to do some pre-trip scouting for photo opportunities, check out my article on The Art of Travel Photography – Planning Your Shots. In this article I review the process that I use to do pre-trip photography planning to give you the photography location tips like the ones you see above. In addition to checking out Canon Beach and the Ecola State Park, which are both breathtaking in their own right, there are a number of other beautiful and amazing things to see and do in the area. For some additional ideas to fill out your trip, I have included a list of other attractions in the area for you to review below. The Canon Beach and Ecola State Park area is one of my favorite stretches of coastline in the United States. There are few other coastlines that I have been to that can match its beauty and ruggedness. Below is a gallery of just some of the pictures I was able to take when I visited. I just want to say that your visitor’s guide series is fantastic. You put so much valuable information and photos in your posts that it is very interesting to read. I’ve been to Canon Beach and your post makes me want to go back. You’re sparking my wanderlust. 🙂 Thanks for all of the effort you’re putting into these wonderful articles.